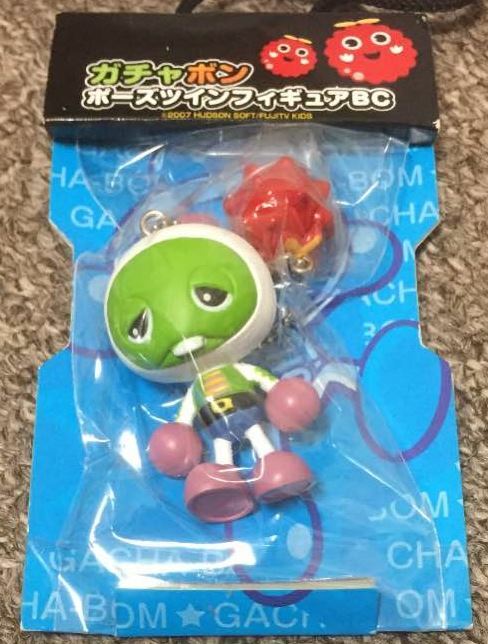 Toys, keychains, piggy banks, gachapon collectibles... this page is a bit of a catch-all for various merchandise, but if it's shaped like Bomberman or part of a series of collectibles, this is where it'll go! 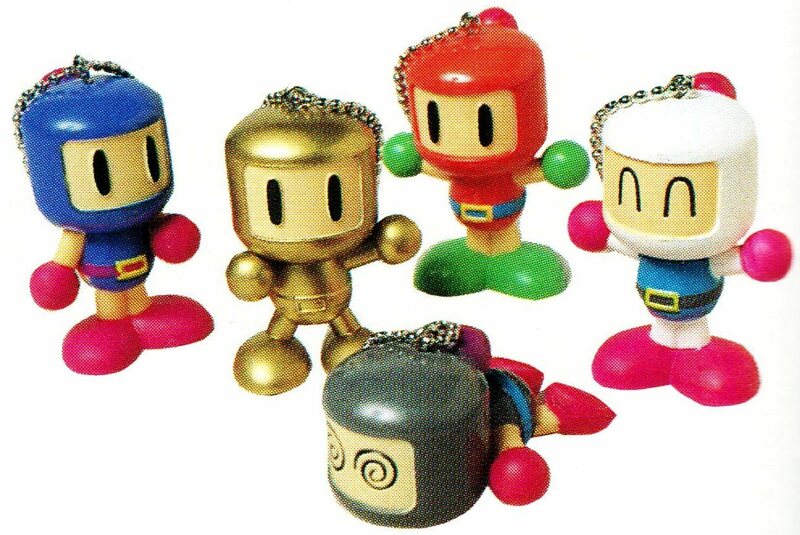 A boxed set of five Bomberman figurines, available as a stamp rally prize at the Hudson Super Caravan 1993 [src] and Hudson Super Caravan 1994 [src]. The figures are intended as cable-straighteners; Super Famicom controllers are fastened to their feet, while PC Engine controllers are attached to the back. The figures can peg together when not in use. A series of super-deformed toy cars by Takara (known in the west as Penny Racers); inserting a coin into the slot on top will generate a charge that propels the car forward. 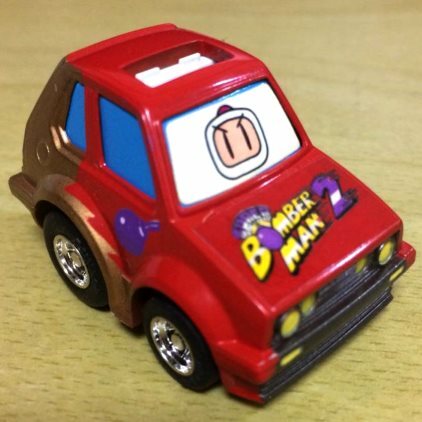 The Chara Q (キャラQ) subline featured cars with imagery from licensed properties, with release #12 being a Bomberman tie-in: A red and gold 1987 Volkswagen Golf GTI with Super Bomberman 2 imagery emblazoned on the hood, windscreen and sides. Released May 1994 [src] and sold for 350 Yen, alongside other video game tie-ins such as Momotaro Densetsu and Fatal Fury. 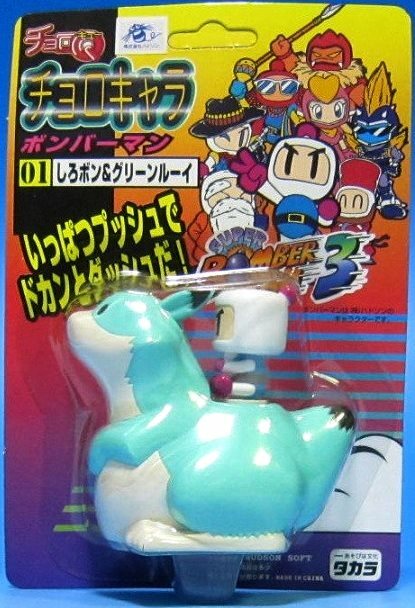 A series of Super Bomberman 3-branded toys depicting Bomberman riding a Louie, released in June 1995 by Takara and sold for 500 Yen. 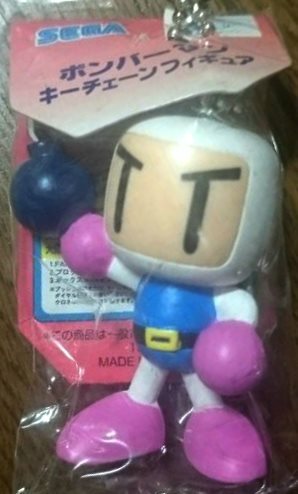 Pushing down on the Bomberman's head and releasing will cause the toy to speed forward. Other releases in the Choro Chara toyline include Nintendo characters Donkey Kong and Kirby. 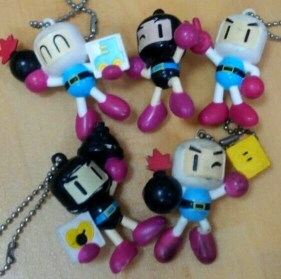 A series of five Bomberman figurines in five colours and poses, approximately 7cm tall with bead chains on their heads. 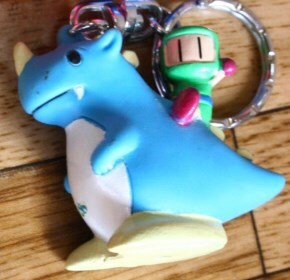 These were exclusive gifts only available at Famicom Space World '95 (ファミコンスペースワールド'95) if you presented your Humor Network membership card at Hudson Soft's booth. A line of four piggy banks that play a sound effect when a coin is inserted. Released as prizes in SEGA World arcades in 1997 to tie-in with Saturn Bomberman. Each bank stands approximately 5 inches tall. 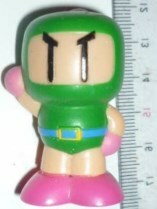 A plastic piggy bank sold by Takara in 1997 as a Baku Bomberman tie-in. 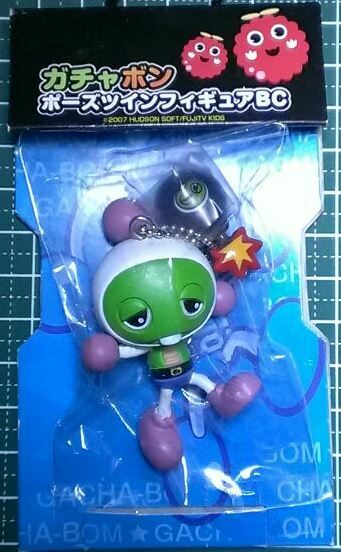 Roughly translates to "Emerging Bomberman". 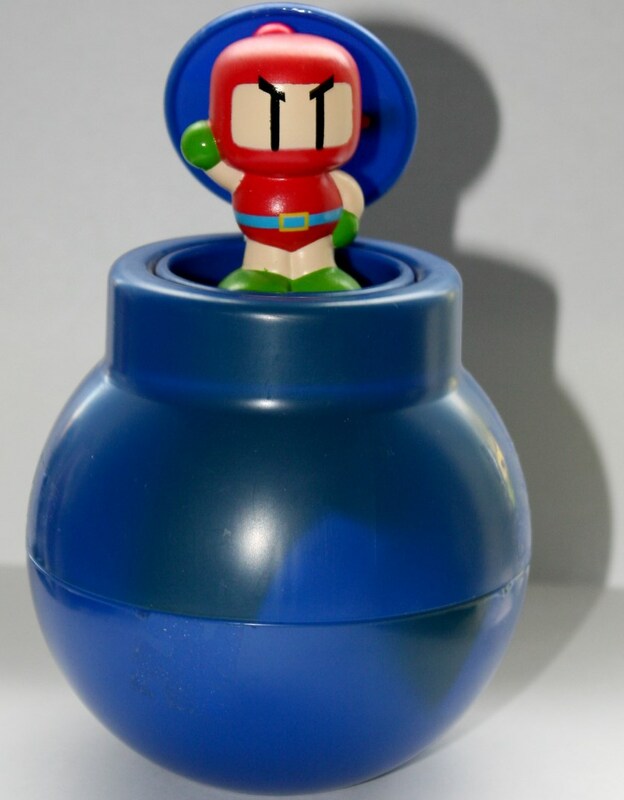 A large blue bomb with a coin slot; inserting a coin will make a Bomberman figurine pop up out of the top of the bomb. As far as I'm aware the figurine is mounted to the bomb and cannot be removed. Known variants include White and Red. 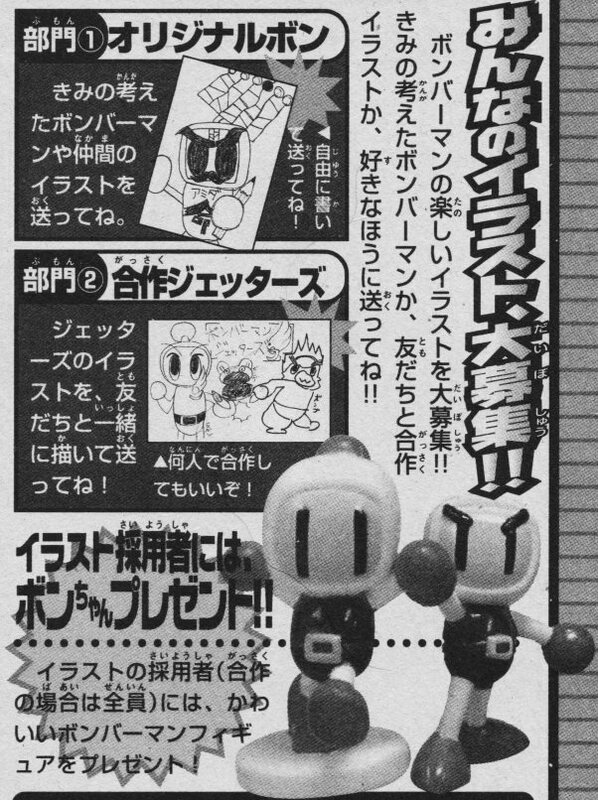 A tie-in for Baku Bomberman sold through Hudson's Humor Network newsletter in August 1998 [src], though possibly sold in stores too. 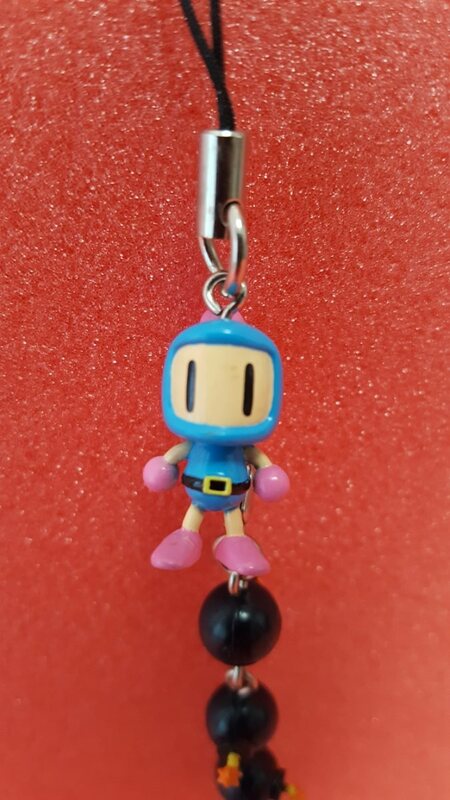 A little plastic Bomberman (approximately 1.5cm tall) you can attach to your bag, jacket or whatever you want to dangle things from! Commonly seen with a hoop on their head and a thick thread lanyard from their feet, but also sold in baggies with a keychain clip on their head instead. Known variants include White, Black, Red and Blue. 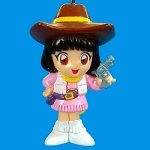 Kira Kira Bomber (キラキラボンバー, or Sparkling Bomber) appears to be the same figurine cast in translucent plastic, intended as a cellphone charm. Also likely a limited run item. 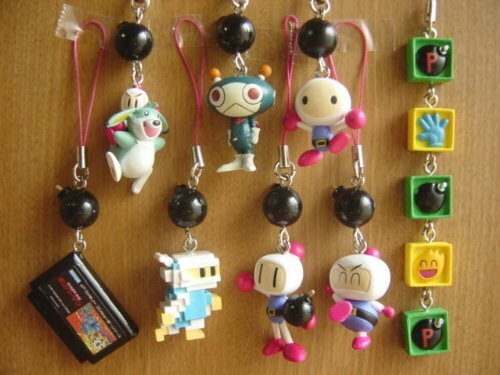 Small figurines of Bomberman with bead chains dated both 1997 and 1998, presumably released as prize items at SEGA World. 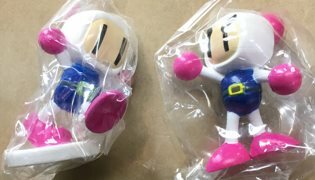 The cardboard backing in their baggies identifies them as Saturn Bomberman Fight!! tie-ins. Known releases include White, Black, Red, Blue and Green Bomberman. 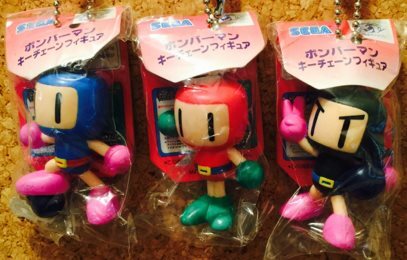 A small line of figurines available as prizes at SEGA World arcades; the toy is dated 1998, while the packaging is dated 1999. 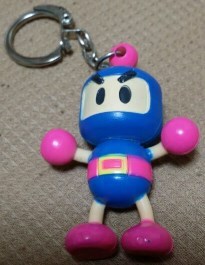 When placed on the palm of your hand, it says one of two phrases: "Bomberman!" or "勝負だ / Battle!" 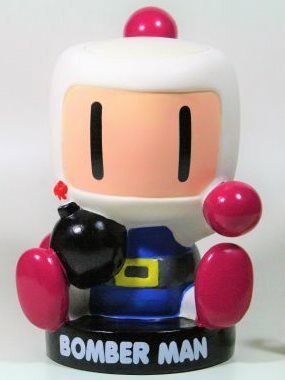 Figures include White, Black, Red and Blue Bomberman. 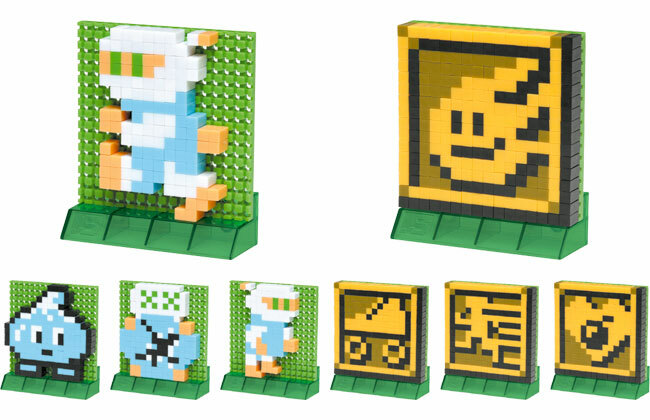 The Bomberman Premium Set (ボンバーマンミニマスコットプレミアム8体セット), a carded set of eight Mini Mascot figurines featuring two exclusive figurines: Blue Bomberman (riding) and Yellow Bomberman (smiling). This prize was limited to 5,000 winners. 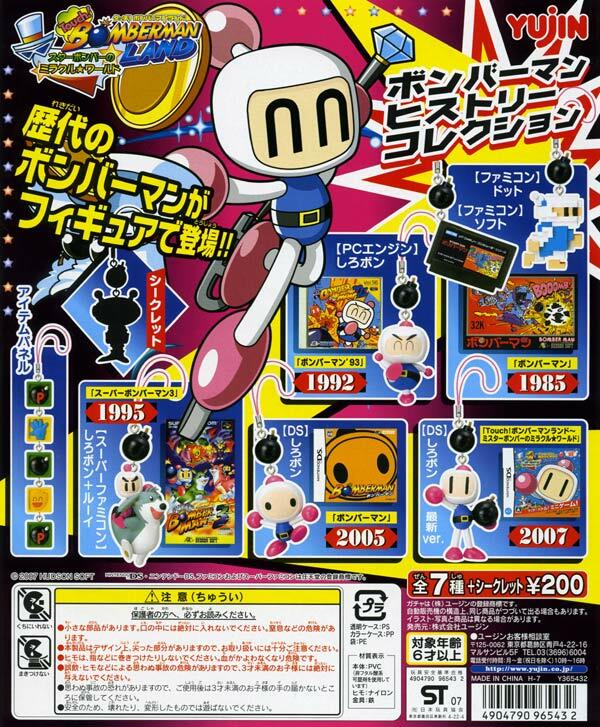 Bomberman MAX: Ain Version, an exclusive version of the game that was not sold at retail. This prize was limited to 2,000 winners. 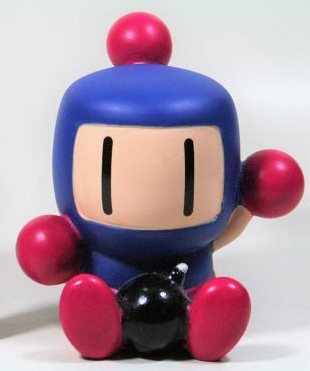 Two static figurines approximately 5cm tall, one of Bomberman marching and another of him pointing. Awarded as a prize for a Bomberman drawing contest in Monthly CoroCoro Comic (月刊コロコロコミック) No. 294, October 2002. A tie-in for Bomberman Kart DX available only to buyers who preordered the game between March 3rd and April 15th 2004 [src]. 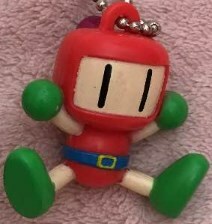 A small Bomberman head with a racing visor, with a keychain and lanyard connected to the top. If connected to a compatible cell phone, the bobble will illuminate when it receives an incoming call. 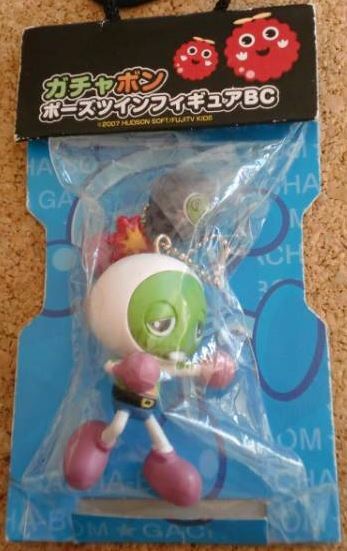 A series of blind boxes by Yujin released in April 2005 [src], selling for 315 yen. 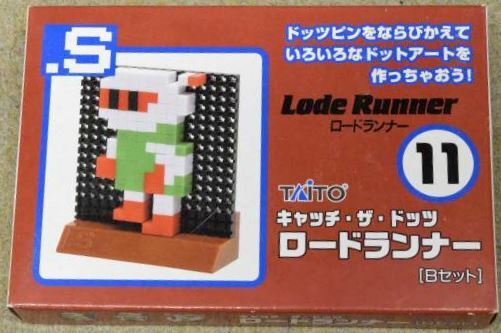 Featuring pixellated voxel recreations of sprites from various Famicom games, approximately 3cm tall. 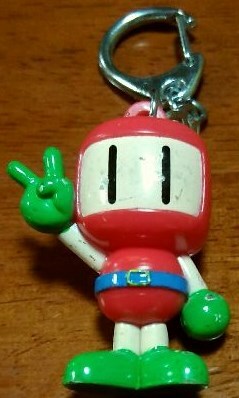 A Bomberman figurine with a keychain on top and a chain of four bombs attached to its back, intended as a cellphone charm. Released by Banpresto on April 20th 2007 [src] in four versions: White, Black, Red and Blue. .S (pronounced "dots", sometimes parsed as "Dot-S") was a toyline by TomyTec released from 2005 to 2008. Arguably a 'building toy', it consisted of coloured pins you could press into a board to create pixel art images, similiar to a Lite Brite or Perler. Starting in July 2006, a new subline was distributed exclusively through Taito's brand of amusement prize games [src], titled Catch The Dots (キャッチザドッツ), a play on Taito's "catch the heart" slogan. 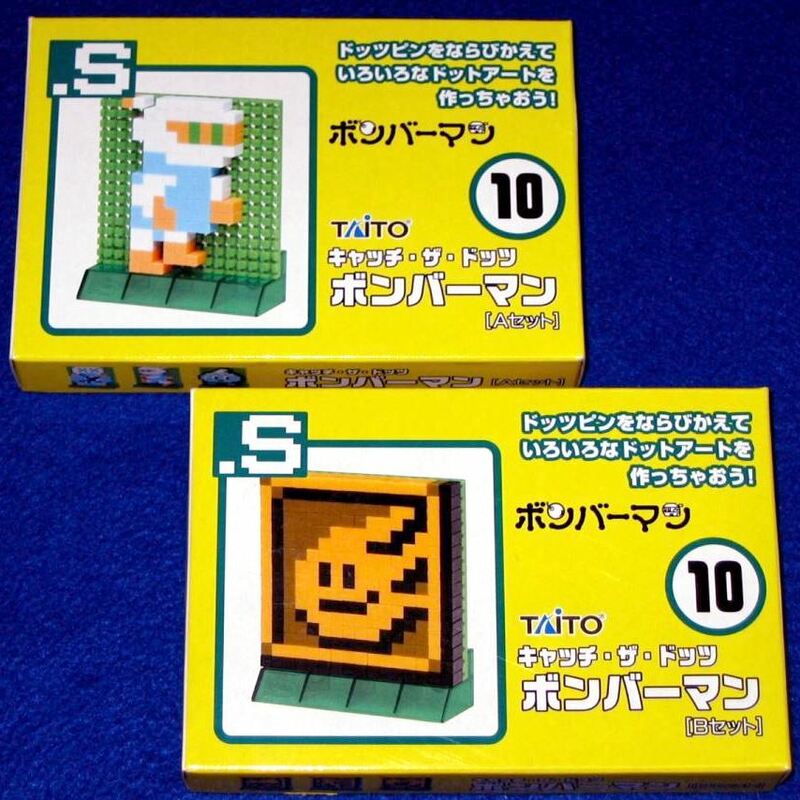 These small kits focused exclusively on Famicom games with at least two sets per game, each containing different pins intended to recreate specific sprites. Bomberman was the second-to-last release in the series (with the tangentially-related Lode Runner as the final release) [src]. #10 in the series. Released March 2007. #11 in the series. Released April 2007. A series of plastic styluses for the Nintendo DS sold as gachapon capsule toys for 200 yen. Released by Yujin (ユージン) in August 2007 [src] to tie in with the release of Touch! Bomberman Land 2: Star Bomber's Miracle World. A series of figurines intended as cellphone charms released by Yujin in September 2007 [src] to tie in with the release of Touch! Bomberman Land 2: Star Bomber's Miracle World, and as a celebration of the franchise's 22nd anniversary. The figurines highlight unique character designs from the NES game, the PC Engine era, Super Bomberman 3, Bomberman on DS, and Touch! Bomberman Land. 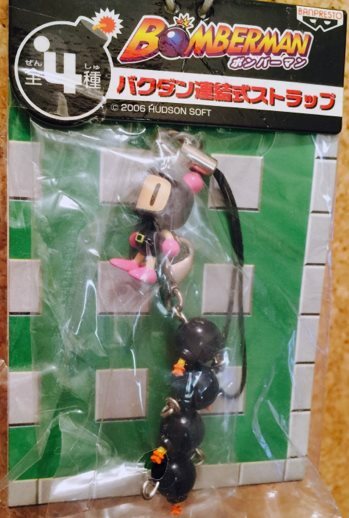 Manufactured by Daicho (大長) and released in 2007 as prizes or promotional items to tie in with the Gachapin ☆ Bomberman mobile game; details are hard to find, but they definitely weren't for sale. 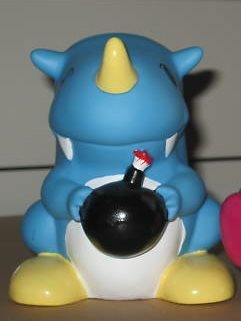 Three keychain figurines were available, depicting Gacha-Bom in different poses with either a bomb with his face on it, or a tiny orb-shaped Mukku. Original Colour Version 2 高橋名人の冒険島Ver. Adventure Island Version 3 ボンバーマンVer. Star Soldier Version 5 Joycard mk.2 Ver. 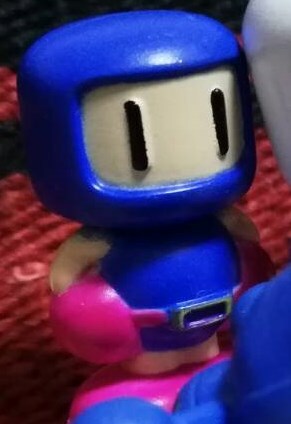 A small recreation of Bomberman's sprite from the Famicom game (8cm tall and 4.6cm wide), produced by Kenelephant (ケンエレファント) and released between October 2014 [src] and January 2015 [src] Other releases in the line include Tao (from Yie Air Kung-Fu) and Twinbee. There's a lot of Bomberman crap out there, and so much of it is totally ephemeral with little to no online record. Maybe someday we'll find out where these little guys belong! 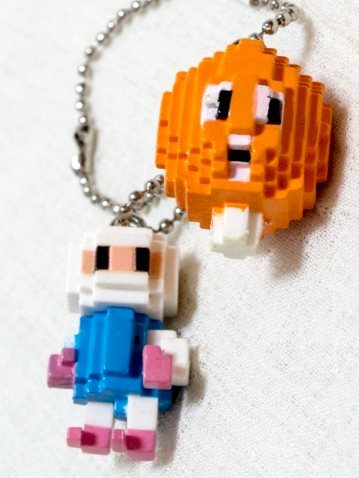 Small keychain figures approximately 5 to 6cm tall. Six known figures (White Bomberman w/ bomb not pictured). 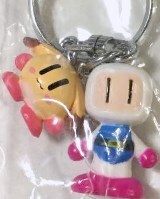 Referred to as "Bomberman Figure Keychain" (ボンバーマン フィギュアキーチェーン) on this site and dated April 2011, but there's no identifiable manufacturer or year on the figures. A little Honey figurine, looks to have a string coming out the top of her hat. 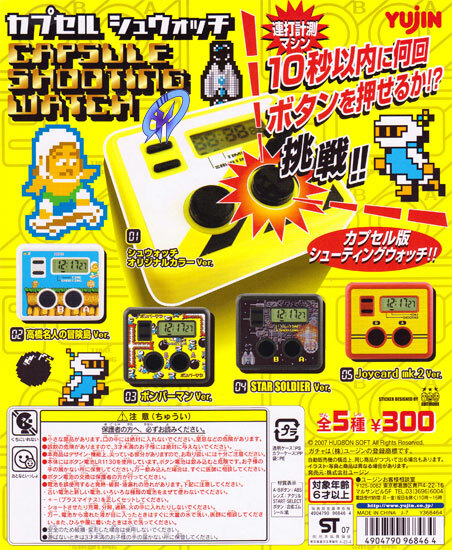 Omachayaya cites it as a SEGA product - no year or toyline attached. A Saturn Bomberman Fight!! tie-in? 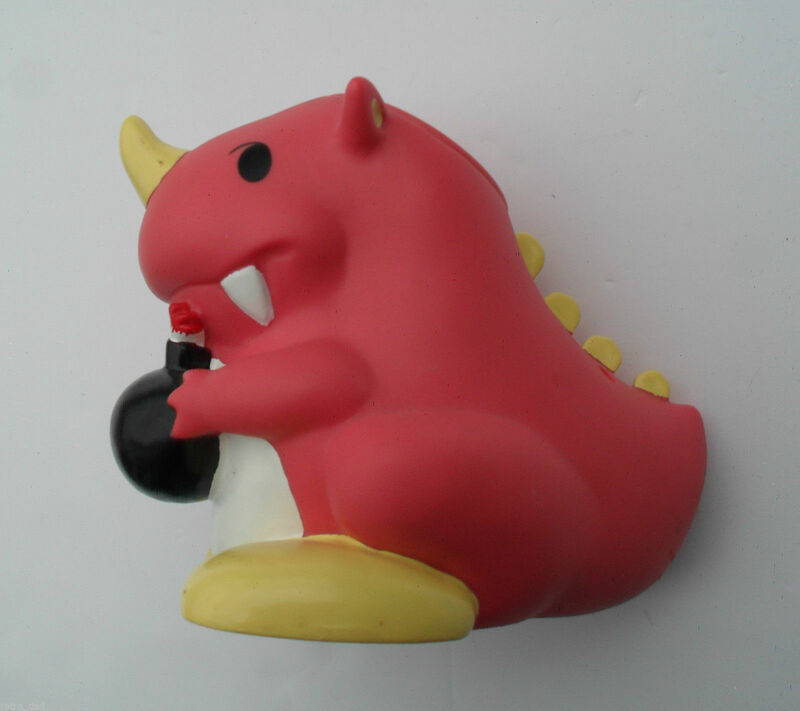 A keychain approximately 4cm tall. Obviously a Saturn Bomberman tie-in with the Tirra and all. No manufacturer or year engraved on it. 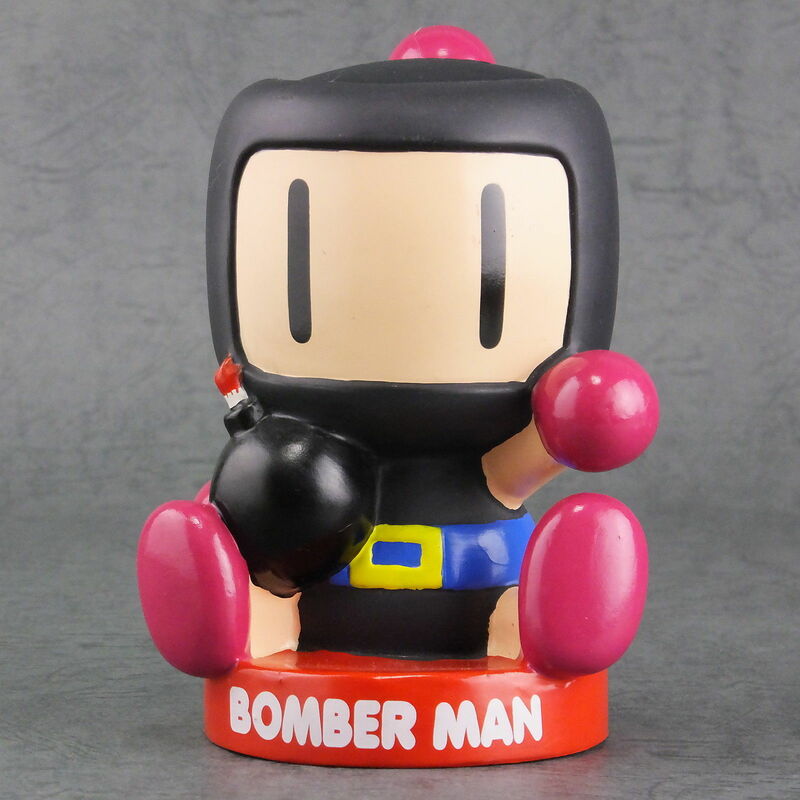 Known variants include Black, Red and Green Bomberman. 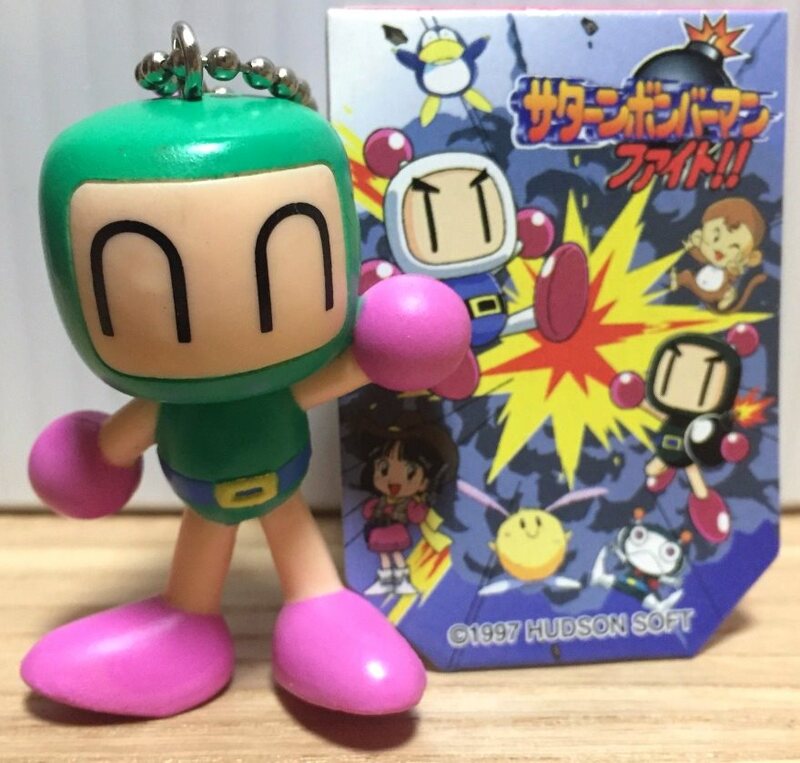 Looks exactly the same as the figurine from Detekoi Bomberman... except this version has "1996 HUDSON SOFT" engraved on the back of its head, while Detekoi's has no markings. Known variants include Black and Green Bomberman. These toys have no year or manufacturer engraved and next to nothing known of their dimensions, material or origins.